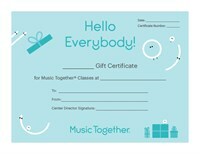 Give the gift of family music making with a Music Together Chesapeake Gift Certificate. Select the amount of the certificate. Indicate whether the certificate will be shipped to you or directly to the recipient when selecting the shipping address. In the comment field, include the recipient's name and phone number, along with your personalized message. Gift certificates will be mailed via USPS. Should the amount of the certificate exceed the tuition, the recipient will receive credit towards a future class. Gift certificates are only valid with an authorized signature of a Music Together Chesapeake representative. Gift certificates are not valid for classes at Maryland Hall.